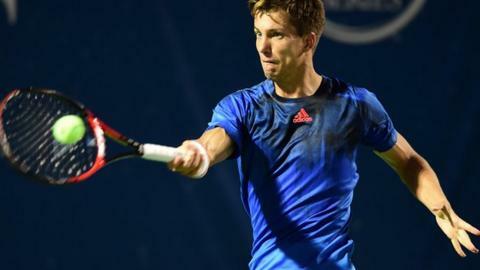 Aljaz Bedene will not be eligible to represent Great Britain in the Davis Cup final after the sport's governing body adjourned his appeal until March. Bedene, 26, played in the competition for Slovenia three times before gaining UK citizenship in March. A Davis Cup rule change now prevents players representing a second country. But the British number two has appealed on the grounds his passport application was lodged before the rule changed at the start of 2015. "There is understandable frustration, and some anger, within the LTA that an appeal scheduled five months ago has broken up with such an unsatisfactory conclusion. My understanding is that Bedene did briefly meet the ITF board, but that no formal hearing took place as the board felt ill prepared to make a decision - partly because of the questions raised by a substantial document the LTA submitted a week beforehand. The next opportunity for the LTA to make its case in person will come in Moldova in March, when Bedene is scheduled to play in Miami. An appeal, it seems, could only be brought forward if the LTA is happy to forgo a face-to-face hearing." The International Tennis Federation (ITF) said the hearing of the appeal would be adjourned until the next board meeting on 20-21 March, 2016, to "ensure the rights of all parties are to be considered". In a statement, the Lawn Tennis Association said it was disappointed with the decision to postpone the hearing. "We feel it is important to state that we have complied with the process set forth to us and are working hard to achieve a positive outcome," the LTA statement read. The adjournment means Bedene will be unable to represent Great Britain in next week's Davis Cup final against Belgium and will also be ineligible for next year's first round, set to be held on 4-6 March. The LTA added that it was in "everyone's best interest" that a hearing took place "ideally" before the first round of the 2016 Davis Cup. "We continue to fully support Aljaz in his bid for a successful appeal," the LTA said. World number 45 Bedene, who has lived in the UK since 2008, said on Twitter: "Disappointed that the hearing with the ITF was postponed, I will keep my head held high. Hopefully more positive news are coming in March. Thank you everyone in British tennis for your help." "Bedene has got a lot of other tennis to concentrate on but I think it is disappointing the ITF can't make the decision before the first round of next year's Davis Cup competition. I think they're sitting on the fence, but I can understand it because with the finals coming up, Bedene having never represented Britain, it doesn't seem the right time to make a decision on that." Jamie Murray, who has been named on the provisional five-man list for Britain's team, said: "They've obviously had a lot of time since the previous meeting. I guess for him it's pretty frustrating, a lot of time wasted for a lot of people that put a lot of time into it. But hopefully in March he gets the green light." British number one Andy Murray - Jamie's younger brother - will lead Britain's bid for a first Davis Cup title since 1936 when Leon Smith's side take on Belgium in Ghent on 27-29 November. The postponement of the hearing means either James Ward or Kyle Edmund will likely take the second singles spot in the team after they were named in the provisional team. Captain Smith does not have to finalise his four-man line-up until a week on Thursday, and is likely to see how Edmund and Ward perform in practice on clay at the Flanders Expo before making a final decision.